The swarm included two significant shocks measuring 5.7Mw and striking at depths of about 8 km. The earthquake swarm occurred within the Afar Triangle where the Arabian Plate, and the two parts of the African Plate (the Nubian and the Somalian) diverge. 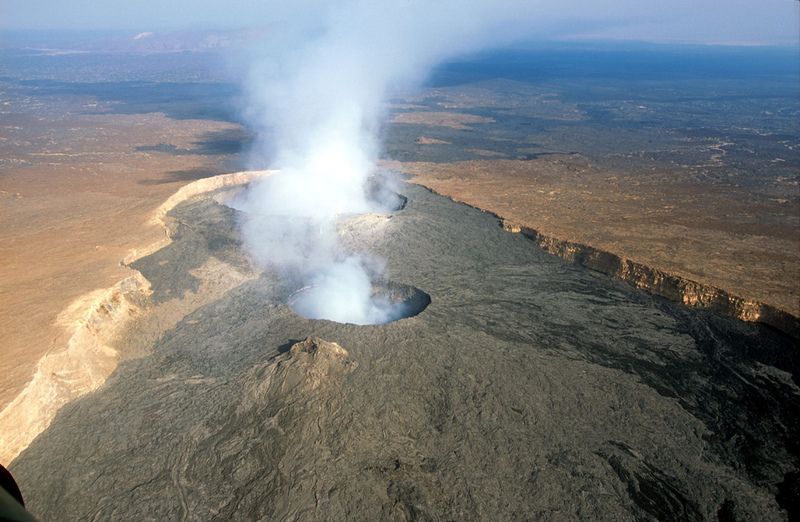 The swarm’s center was located about 100km ESE of Erta Ale volcano, and about 160km NE of the Dabbahu Fissure. FIRE-EARTH believes there’s a strong probability that the quakes may have primed one or more regional volcanoes for eruption. Dabbahu Fissure. Original image JPL/NASA. Enhanced by FIRE-EARTH. Since earlier this morning local time a swarm of at least a dozen earthquakes have struck Christchurch, New Zealand. The largest shocks measured 5.2 and 6.0Mw, USGS/EHP reported. At least 10 people were injured and several buildings have collapsed/were damaged as a result of the earthquakes, reports said. FIRE-EARTH Moderators have decided NOT to post any specific earthquake forecasts for New Zealand Region until further notice. See the comments section for a explanation. NZ scientists: Intellectual rigor mortis set?